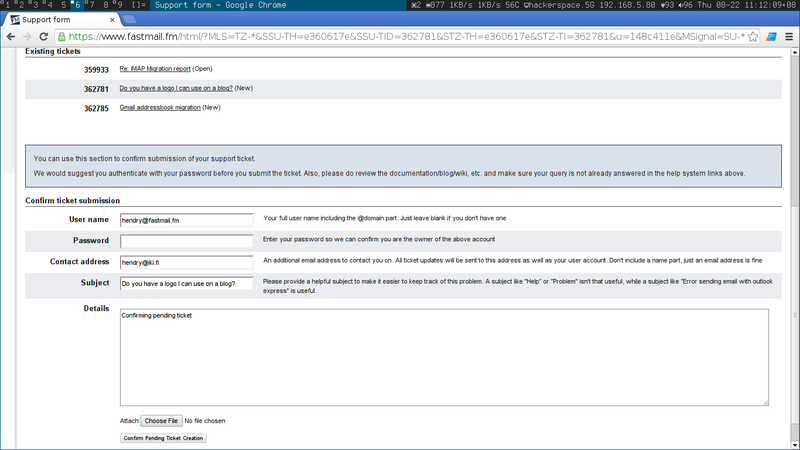 So I'm attempting to migrate my emails from Gmail to https://www.fastmail.fm. Why? I don't like the privacy implications with Gmail and especially the new Gmail Compose UI. So I signed up for a Fastmail trial and the thing that bothers me is that you apparently don't get support unless you pay. But I don't want to pay until I know I can successfully "on board" to Fastmail. Tbh fastmail support have come through for me, despite not paying them yet! The first annoyance I ran into is the ridiculous default fastmail footer, which I promptly removed. To those who have the same footer as defined your From: address, you're are creating noise. argument at /home/mod_perl/hm/ME/ImapMigrate.pm line 269. The Gmail server seemed to refuse access to the account because it came from a New York IP. This was eventually resolved, but it took some time. It's a bit unnerving that Fastmail is hosted in the US, though I wrote to privacy@fastmail.fm asking about it and they say although the NSA can physically seize their hardware, they would have to go through Australian law to access your account through Fastmail. So this is a "one-time only action" and it doesn't do anything clever like keeping your emails in sync with Gmail. So if I don't switch my forwards, my emails will get more out of sync as everyday passes. While the "Migrate IMAP" is happening, it looks rather strange, emails are constantly being injected into the DOM. However once this "one time" process finishes, I can't find my Gmail labels/folders of my mail! Despite using Fastmail's Global Bayes database, I am getting a lot of spam. Annoyingly sometimes from the SAME X-Mail-from: address. Fastmail argue after time your personal database will become trained. It's a shame that somehow when you move away from Gmail you can't bring along your own "Bayes database". Update: After using Fastmail for more than a month now, I can honestly say it's improved a lot, but not quite as perfect as Gmail... yet. Gmail's filters work really well. I love the fact you can test and then apply them on email after the fact. My experience with Fastmail's Rules has not been good! :( Gmail's UX is better. I've exported my contacts from https://www.fastmail.fm/contacts/ using vCard standard and imported them into https://www.fastmail.fm/contacts/. I have something like 6k+ contacts thanks to Gmail's automagic adding of contacts. A lot of the contacts could be pruned, but there is no sane UI to do that. The password field on support tickets is also quite jarring to me. I should be logged in already!? Have to use shift+alt+down instead. Btw their mobile Web client is pretty damn good! Push on iOS is currently only possible using ActiveSync, a proprietary protocol from Microsoft that you have to pay licensing fees to use. We don't currently support ActiveSync and have no immediate plans to do so. This is all really annoying, because there is a way for IMAP to support push, but Apple don't want to support it. Additionally Apple apparently have their own proprietary IMAP extension to do IMAP push (http://www.dovecot.org/list/dovecot/2012-August/067682.html), but it's not officially documented so attempting to use it might just end up in our servers being blocked. Having said all that, we're looking at another option, which is to create our own FastMail app which could support our own push protocol. Hopefully we'll have something by the end of the year. The "Notes" on the iPhone is a different thing and is not related to our notes in the webinterface. At the moment, we don't support the "Notes" sync feature on the iPhone. Its also not something we plan to support in the near future. You can easily find the oldest emails, so I can see the first email between my wife and I from Aug 5 2005 in Melbourne! Fastmail listens to you. However their support mechanism could be better and they also could be better with twitter support too.